Don't you just love the color of aquamarine? Of course! Who doesn't love this completely stunning color? These studs are 4mm heart shaped cut, matched perfectly for the 14K White Gold setting they are set in. These earrings are going to be the talk of the season, and you will definitely receive various compliments regarding your newest addition to your jewelry box! These almost clear colored earrings can be paired with any pair of heels, and most any color choice of dress you pick. There is no need to worry about changing your outfit when you absolutely are dying to wear these earrings. The earrings will stay in place all night with the post with friction back, which is included with the earrings. These backs are perfect for preventing pinching that can be caused with traditional earring set-ups. 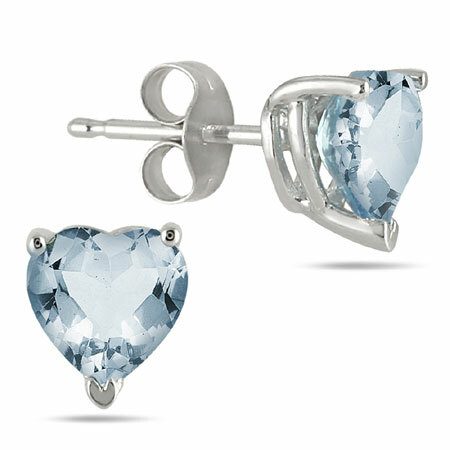 We guarantee our Heart-Shaped 4mm Aquamarine Studs, 14K White Gold to be high quality, authentic jewelry, as described above.